Array ( [:db_insert_placeholder_0] => civicrm_handler_field_custom_file [:db_insert_placeholder_1] => class [:db_insert_placeholder_2] => sites/all/modules/civicrm/drupal/modules/views/civicrm/civicrm_handler_field_custom_file.inc [:db_insert_placeholder_3] => civicrm [:db_insert_placeholder_4] => 0 ) in _registry_parse_file() (line 179 of /xxxx/drupal70/includes/registry.inc). By doing this above steps I can able to resolve this issue. 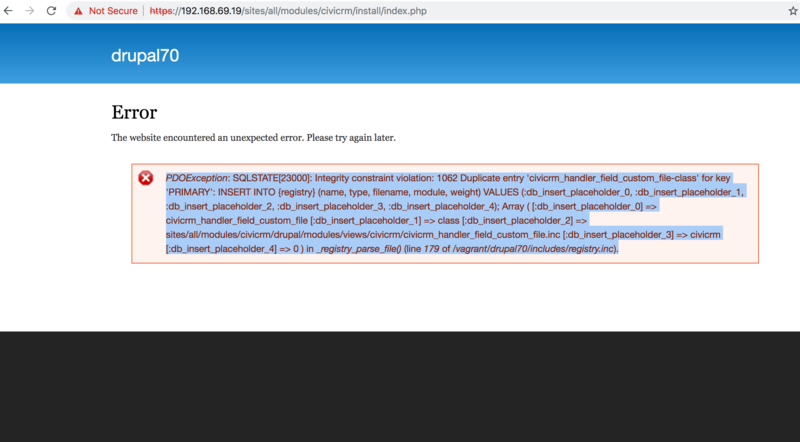 The error message seems like you have two duplicate entries for civicrm_handler_filter_custom_file-class in registry table. Search for civicrm_handler_filter_custom_file-class in name column. Check if there are two entries found. If yes, delete or rename one of them to see if it fixes the issue. Not the answer you're looking for? Browse other questions tagged drupal webform-civicrm php or ask your own question. Anyone else getting a webform error for a non-required date field?